Big sanders deliver a more uniform finish, but because if the big size, they also require more power; more power often leads to greater vibration because of the amount of mass that is being moved. Bosch says that their vibration control system keeps vibrations to a minimum by isolating the grip of the tool from the working mechanics with eight heavy-duty foam blocks that do their part to absorb the vibrations. The OS50VC ½-sheet sander is packing 3.4 amps of power with a variable speed dial. A paper clamping system called Sheetloc Supreme is featured on the sander, which automatically tensions the sanding paper as it is being clamped. Or if you prefer, stick-on paper can also be used. The backing pad itself is an extra soft microcellular material that conforms to different contours. To round out the tool, it has soft grip areas to further reduce fatigue, a removable auxiliary handle for tight space operations, a rugged die-cast aluminum gear housing, and a transparent mircofilter screw-off dust canister with integrated paper filter. 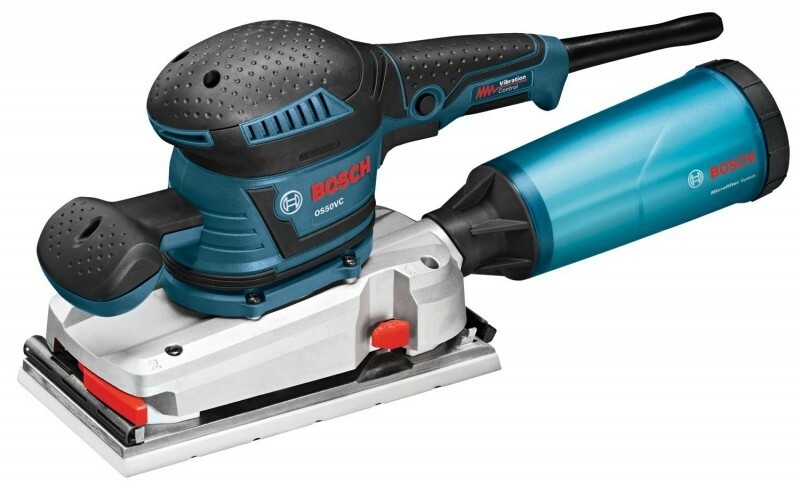 Hose connectors are also included so that the Bosch OS50VC can be connected to a vacuum for even better dust control. The OS50VC Half-Sheet Orbital Sander is available now for a retail price of $379 at dealers nationwide. An optional L-Boxx with high-quality foam inlay is also available.